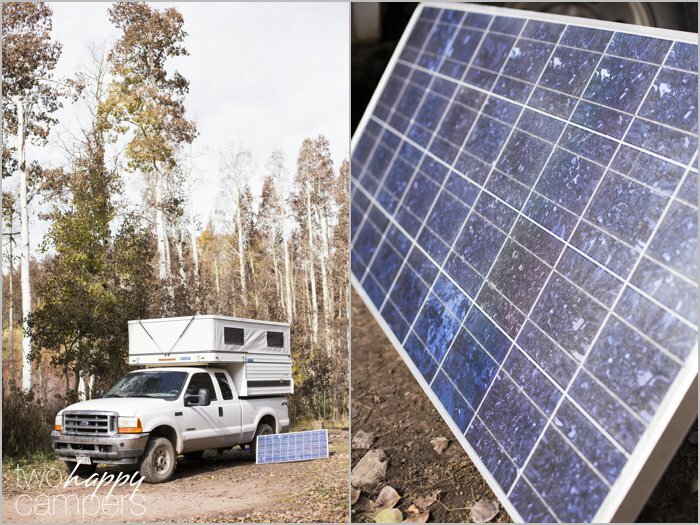 When we purchased our FWC truck camper we included a 85 watt solar panel and two auxiliary batteries with our purchase. The purchase proved to be a good one as we primarily camp in remote places with no access to hookups of any kind. Running our refrigerator, the furnace and charging electronics had been no problem with the solar panel. That was true until our first winter. With the sun staying low in the sky throughout the winter our solar panel was not able to fully recharge our batteries. If our panel was able to tilt and wasn’t fixed to our roof this would not be a problem, however that is not the case. 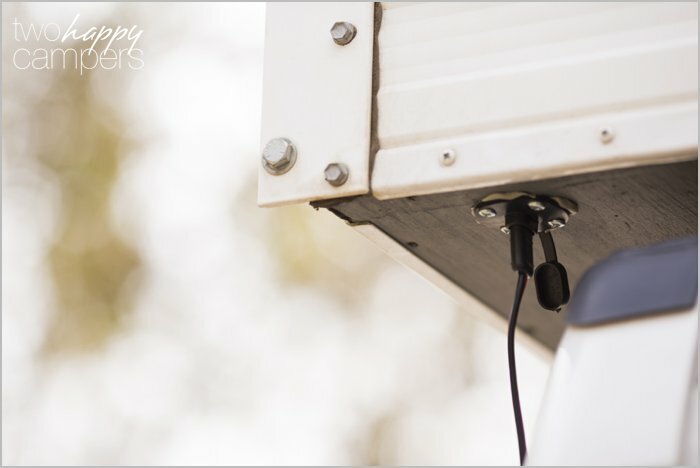 Over the summer, Mark installed a second panel (120 watts) that can be pointed at the sun for maximum power. 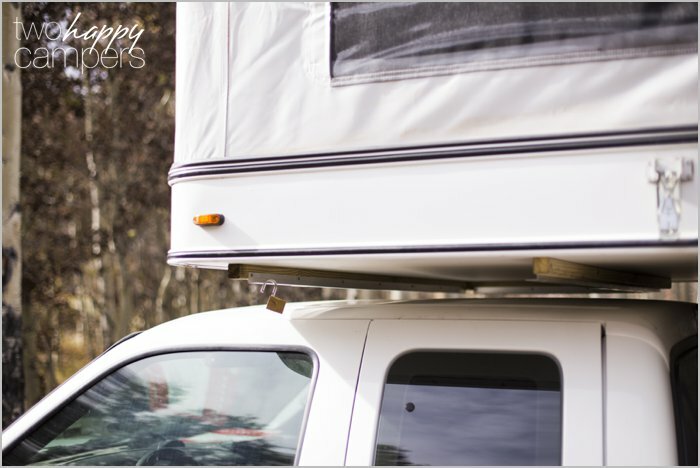 Anyone that owns a truck camper knows that taking advantage of every square inch of available space is key. This second solar panel install is a perfect example of that. 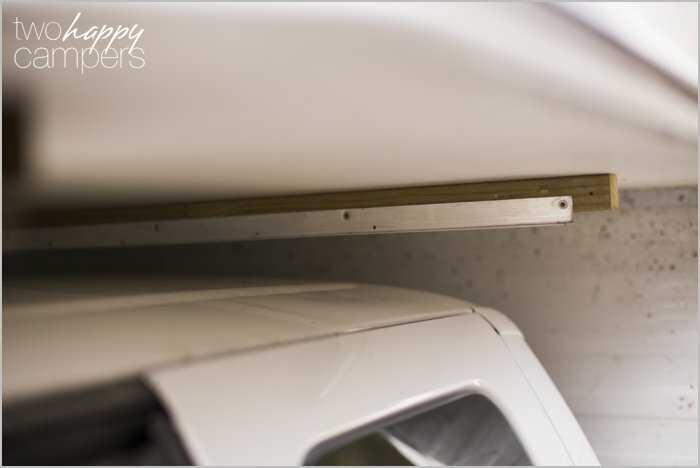 As you can see in the photo below, Mark built a frame out of 2×2 wood and angle aluminum then mounted it underneath the cab-over section of the truck camper. 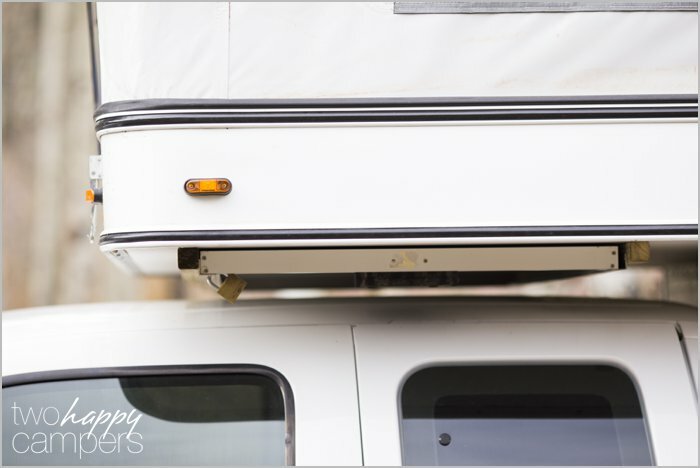 The solar panel easily slides in and out of the frame and is secured snugly against the truck camper. 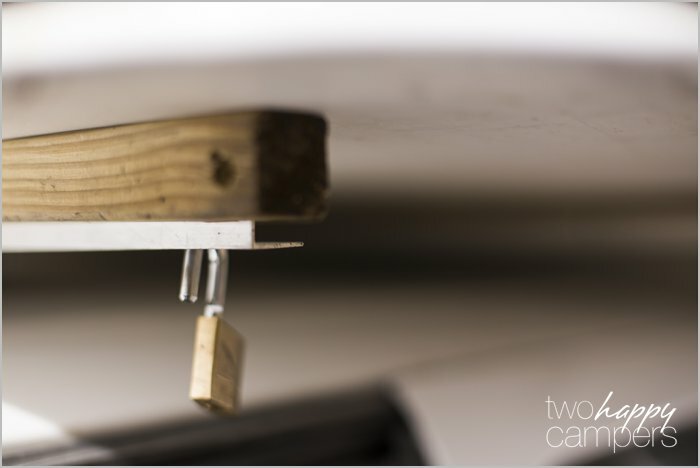 A padlock insures the panel will not come out while we’re driving and also keeps it secure from theft. 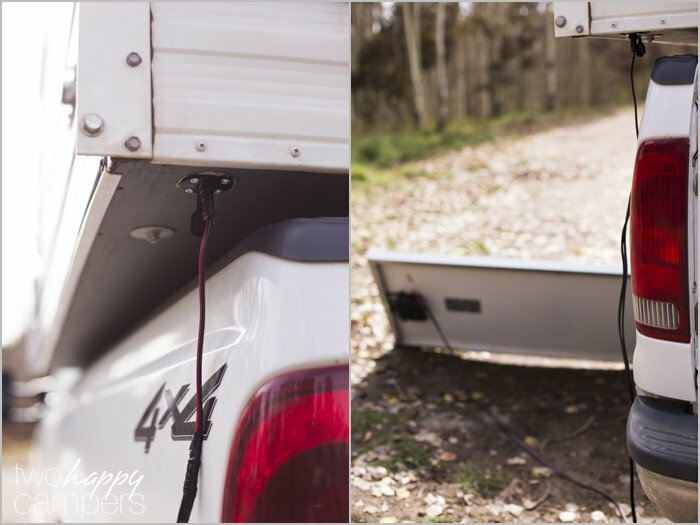 At the rear of the truck camper, Mark installed a quick connect to plug the panel directly in to the solar controller. Below is the frame with the solar panel stowed away. Another with the solar panel stowed in place. Now we can keep our batteries charged 365 days a year as long as the sun is shining. 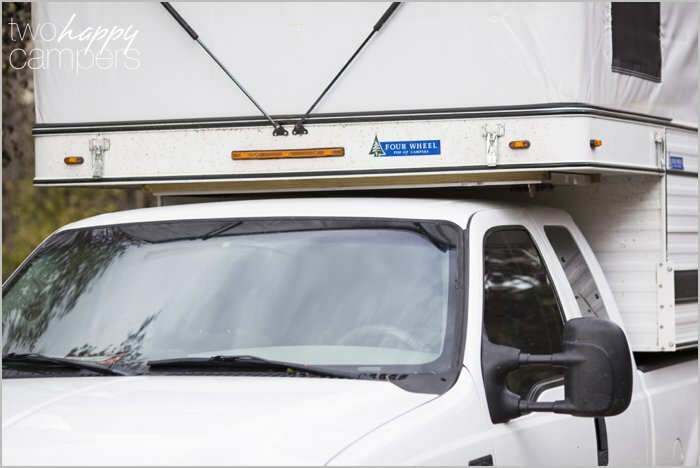 If you’d like to read about more modifications and additions we’ve done to our Four Wheel Camper, check out this article: Mods & Additions to our Four Wheel Camper. Updated to add: We now also have a folding portable Zamp Solar panel. A super convenient, user-friendly solar option. Click here to read more. Hi There! Could you link the site where you purchased the solar panel? Has it been working well so far? Thanks! Hi Natalie. Thanks for reading! Yes, it’s been working great! Thanks for reading Bill! Let me know if you have any questions about the solar set up. Thanks for sharing your solar tips. I’ve been looking at the solarblvd site and it look s like they offer kits that come with the Photos charge controller and display. Is this what you are running? I’m asking because solarblvd seems to have VERY competitive pricing on these kits. Just want to make sure they are good quality. If you’re not using the Phocos controller, what are you using and how is it working out for you? Thanks again for the info!! Can’t wait to order my solar rig! Hey guys! Big fan of your blog. Finally got myself a four wheel this weekend and found a sweet one used. Excited to leave my job this fall and travel the west! 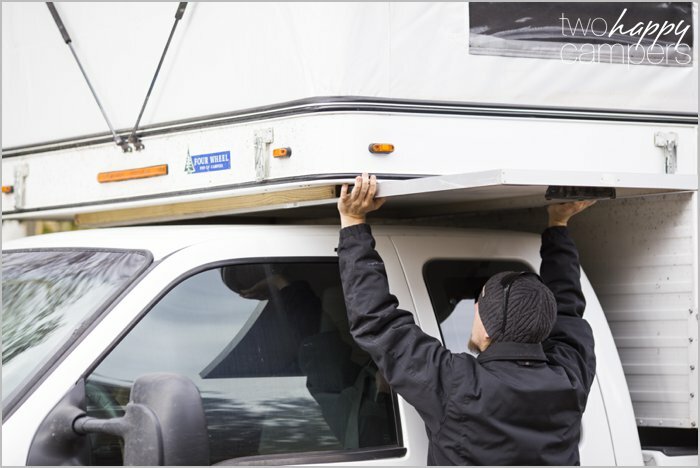 Question — how did you all mount the 2x2s underneath the camper for this solar mount? 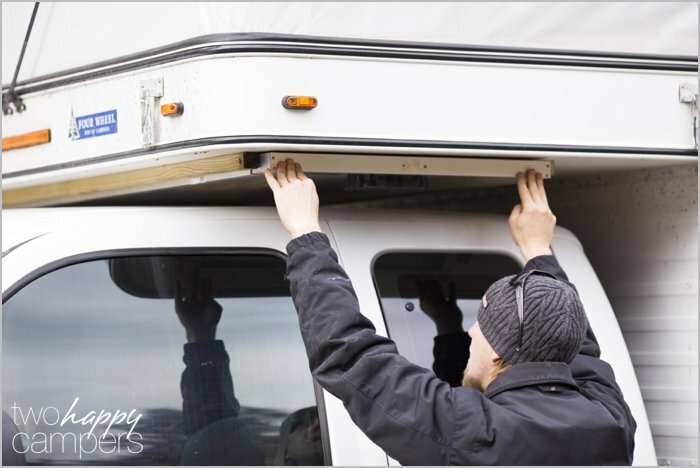 Help please: how did you fasten the 2×2 wood strips to the bottom of the camper for storage of the extra solar panel. 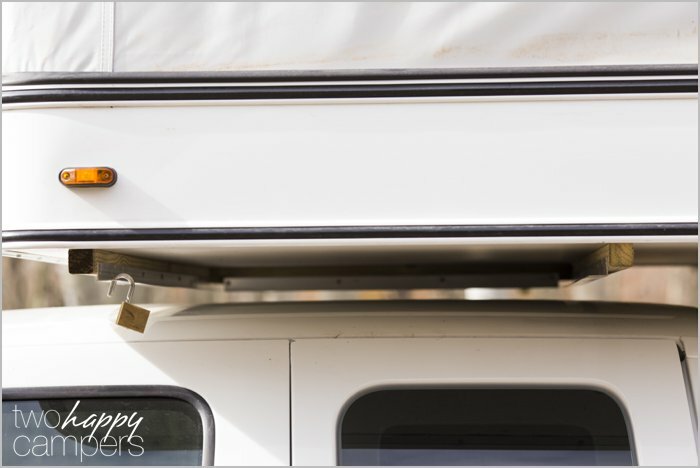 So at least two people have asked about how I secured the 2x2s to the bottom of the camper overhang. We had a crazy winter and kind of let some of our Two Happy Camper stuff go so sorry if I didn’t get back to those people. I’ll try to explain as simply as possible. First I removed the bed and slide out portion of the bed. Next I laid out my pre-built solar panel tray on top, inside the camper and used wood screws to go all the way through the tray and into the overhang of the camper. Then, with Michele’s help, put the tray outside underneath the overhand and used the holes created by step two as a template to put those same wood screws through the overhang and into the solar tray below. The screws are counter sunk so they won’t interfere with the operation of the slide out portion of the bed. I think this covers it but if anybody needs clarification, just ask, I will try to get you a timely response. As you all may have noticed, Michele is the super-awesome customer service department of Two Happy Campers and I am a slacker. Sorry. 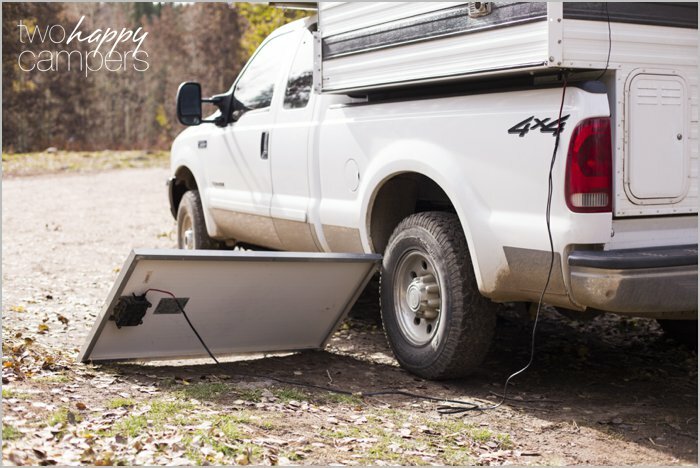 A couple questions on your slide in/out PV panel storage tray: 1) Do the wood screws you used to attach the tray go through the aluminum frame members of the cab-over? I’m not clear on where the structural support is. 2) Any problems/concerns with moisture intrusion around the screws? I would think going down the highway in the rain might force water in there. Or did you caulk the edges of your wood support cleats? I’m contemplating doing something similar with a used FWC we’re looking at, so am interested in the details.